The seven Iberian lynxes (four females and three males) released in December 2009 in Guadalmellato, Cordoba are breeding successfully. Three cubs have been born to one mother, and two other females are believed to be pregnant. The seven animals were the first to be released from the lynx captive breeding programme with the aim of establishing new territories across Spain. In this first case, an area close to the main lynx stronghold of Andújar was chosen. To make their adaptation easier, supplementary food in the form of penned rabbits has been provided – the lynxes can get in, but the rabbit can’t get out. The animals have also been fitted with radio-trackers. The biologists in charge of the project are delighted not only with the news of the cubs, but also because no lynxes have so far died – three to four were expected to do so as they succumbed to the ordeal of adapting to their new territory. One animal has also come into contact with lynxes from Andújar which bodes well that this small population can expand. An important step has been taken this week with the release into the wild of the first Iberian lynx bred in captivity. The two animals were set free in Guadalmellato, Cordoba in the Sierra Morena. Three more are to be released soon. 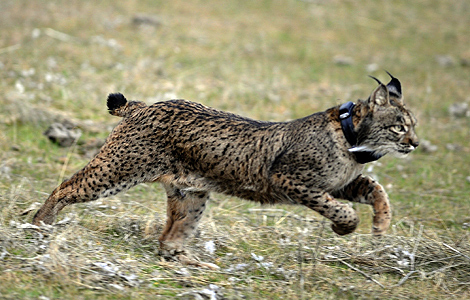 Photo from El Mundo of one of the released lynx as it bounds into the freedoms of the Cordoban hills.